There is probably no subject more intimidating and complex to artists than the human figure. Even artists who have otherwise mastered their chosen medium are unable to render figures successfully. How can artists develop or apply their drawing skills to portray the figure as animate and made of muscle and bone, but without overpowering form with anatomical detail? 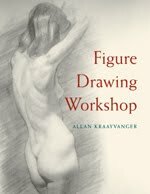 In Figure Drawing Workshop, a veteran artist guides readers through a series of progressive lessons designed to help artists draw the figure with accuracy, simplicity, and skill. Step by step, readers learn how to see and render basic shapes; use line to express energy and movement; depict light and shadow; convey a sense of underlying musculature without overworking a drawing; and draw convincing heads, hands, and feet. Finally, they’ll learn how to liberate themselves from unproductive habits and develop their own creative style. Allan Kraayvanger is a professional illustrator and graphic designer whose study of the human figure has been a lifelong passion. He lives in Mesquite, TX.